What Is Your Optimal Fish Oil Dosage? Which fish oil dosage will give you the best results? I wish I could give you a “one size fits all” answer to that question. But your optimal dosage depends on a couple factors. This page will help you discover your optimal daily fish oil intake. Whether you’ll be getting some or all of your fish oil from actual fish or a fish oil supplement, I’ll provide guidelines for figuring out the right amount(s) of each/either. My recommendation for healthy people is a fish oil dosage in the range of 2000-3000mg combined EPA/DHA per day. However, you should discuss dosing parameters with a qualified medical professional if you have certain medical or health issues that may increase the likelihood of fish oil side effects. If your particular health issue is relatively minor and you can’t or won’t consult a doctor, then you should at least start with a low fish oil dosage (e.g. 500-1000mg of EPA/DHA per day). Realize that your tracking of EPA/DHA intake should include both supplement and food sources. So if you eat fish on any given day, you should take that into account by reducing the number of fish oil capsules you’d otherwise take. In theory, the best way to get fish oils is by eating fish, since it’s a whole food that provides a more complete nutrient profile. However, that kind of diet just isn’t practical, economical or even desireable for most people. Furthermore, eating that much fish would be potentially dangerous because of the health risks posed by the accumulation of mercury and other contaminants commonly found in fish. Whereas, you can buy fish oil supplements that have been purified. 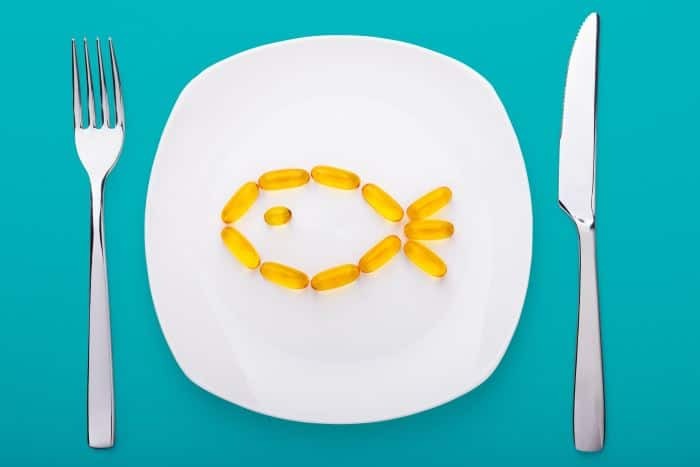 In reality, the safest and most effective approach is to eat fish a few times a week, while getting the rest of your EPA/DHA needs from fish oil capsules. So, how do you find out how much EPA and DHA is in the fish you’re eating? And how much of each is a fish oil supplement? Good questions. Read below for the answers. Real Fish. See this resource for a list of all major kinds of fish and their respective EPA/DHA content. Fish Oil Supps. The quantities of EPA and DHA in fish oil supplements vary from product to product. It’s most common to find fish oil products with 300-600mg of combined EPA/DHA per capsule. This information is on the product’s nutrition label. No Fish. On this hypothetical day, I’m not eating any fish. That means I’ll be getting all my EPA/DHA from my fish oil supplement. In this situation, I’d take 4 or 5 capsules for a total of 2400-3000mg EPA/DHA. Some Fish. On this hypothetical day, I’m in the mood for just a little bit of fish. Probably something modest, like a pan seared 3-ounce shark meat fillet with caramelized onions and a side of risotto topped with a few dollops of crème fraiche. Look at the resource I mentioned ealier and see that 3 ounces of shark has 0.7 grams (rounded), or 700mg, of EPA/DHA. This falls short of my target range. So I’d have to take 3 capsules for an extra 1800mg EPA/DHA and total of 2500mg. Lots of Fish. On this hypothetical day, I’m gonna go all out on a massive “everything” pizza, including 6 ounces of raw anchovies! Using the above-linked resource, we see that the achovies give me almost 2.5 grams (1.232g per 3-oz serving x 2 servings = 2.464g), or 2500mg of EPA/DHA. This is right in my target range, so there’s no need to take any fish oil capsules.